OTE tests allow plant owners to assess the long term running costs of their aeration systems, and confirm that they have the capacity to meet peak oxygen demands. 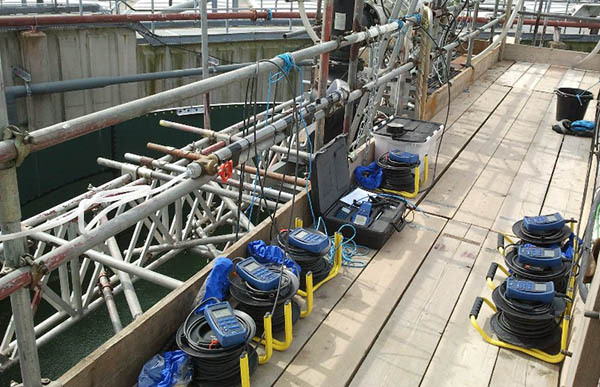 Due to this, utilities will often require on OTE report prior to handover of a new treatment plant, to ensure it meets specification. Aeration testing is conducted to the ASCE (American Society of Civil Engineers) standard "Measurement of Oxygen Transfer in Clean Water" (ASCE/EWRI 2-06). Tests can be conducted on a wide range of aeration devices including fine bubble diffused aeration systems, coarse bubble aeration systems, surface aerators, jet aeration systems and venturi style aeration systems. The test procedure involves measuring dissolved oxygen from near zero to saturation against time, and non linear regression is used to determine the mass transfer coefficient. To achieve near zero dissolved oxygen concentration, the test water is deoxygenated using either nitrogen gas or sodium sulphite, dependent on aeration system type and the practicality of a particular method. Power consumption of the aeration devices is monitored using power monitoring equipment suitable for systems equipped with variable speed drives. It is common to test aeration systems at several duty points to determine the efficiency across the whole operational range of a particular system. The data provided by these tests includes SOTR (Standard Oxygen Transfer Rate measured in kgO2/hr), SOTE (Standard Oxygen Transfer Efficiency measured as a percentage of the air put into the system) and SAE (Standard Aeration Efficiency measured in kgO2/kWh). Often in conjunction with an OTE test an alpha factor determination test is required. Alpha factor represents the ratio of the oxygen mass transfer coefficient (KLa) in process water to the KLa in clean (potable) water. Normally this ratio can range from 0.1 to 1.0 depending on the test conditions not least; the aeration process, tank geometry and water characteristics. Although ideally the alpha factor would be estimated by conducting full-scale oxygen transfer tests with clean water and wastewater, this is usually impractical and a smaller purpose built tank is used. 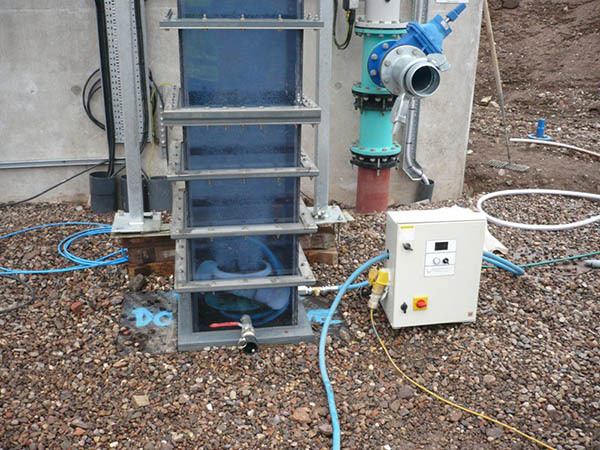 Wastewater Management has performed alpha tests for numerous clients often alongside an OTE testing. Off-gas testing can be used to measure oxygen transfer under process conditions and assess oxygen transfer efficiency (OTEf) and the standard oxygen transfer efficiency (SOTEpw). Simply put, gas is collected via a floating collection hood directly above the diffusers and conveyed to an analyser for measurement of gas flow rate and gas-phase oxygen content. Off-gas testing can be useful for monitoring diffuser performance over time or when assessing the performance of novel devices with a diffused air component under process conditions. OTE tests allow plant owners to assess the long term running costs of their aeration systems, and confirm that they have the capacity to meet peak oxygen demands. Due to this, utilities will often require on OTE report prior to handover of a new treatment plant, to ensure it meets specification.